The high speed hype train begins to slow down. 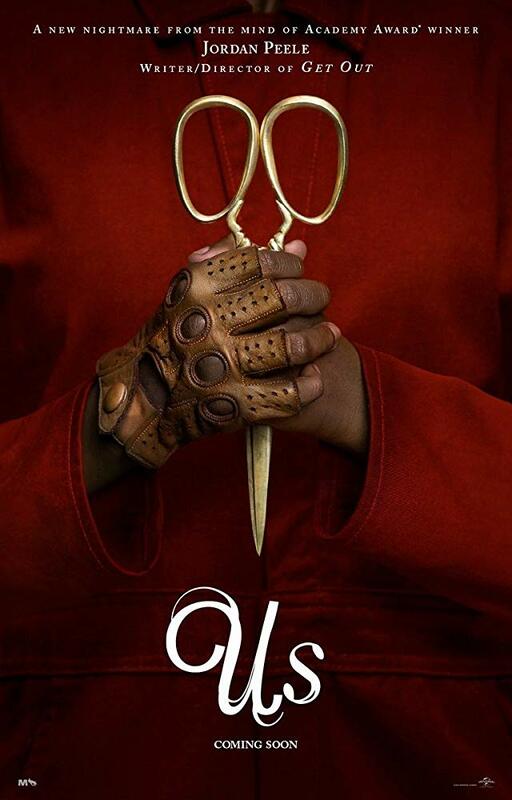 Returning to horror once again, Writer-Director Jordan Peele’s Us hits theatres nationwide this weekend. The highly anticipated followup to the horror masterpiece Get Out ultimately falls short of the bar set by its predecessor. But don’t worry, there is still plenty to like about this intense film. Whereas Get Out was a horror film built upon compelling, thoughtful social-commentary on the uncredited, forced appropriation of one ethnic group by another, Us plays as a straight forward horror film, complete with all the thrills for which you hope to experience. There is certainly an attempt by Peele to comment on class, MAGA, and other important social topics, but the film tries to do too much, and winds up not accomplishing what it so desperately wants to do. Keep your eyes peeled for details, because you are going to need them in order to best appreciate the ending. With Peele’s revival of The Twilight Zone, it is clear that his adoration of that series (which is regarded as the best written series of all time by the WGA) played a roll in the development of Us. Specifically, this movie feels inspired by the After Hours and Mirror Image episodes. Peele delivers audiences an incredibly fun horror movie that is certain to do well over its run in the cinemas. Many of the film’s elements work exceptionally well; but unfortunately, the film is held back from its full potential by weak writing and average directing. Even though Peele’s Get Out, in my opinion, is the superior film, there is still a lot to enjoy in Us. I’ve no doubt that if you’re a horror fan, that you will have a great time! Let Us cut deeper into this film. My biggest takeaway from this movie is that I am convinced more than ever than Jordan Peele should be able to pull off a successful, meaningful revival of The Twilight Zone. The problem with the writing and directing in Us is that it tried to do too much. In an effort to create a deep, rich, cinematic experience that was both horrifying and thought-provoking, the plot is all over the place. Even to the point that it contradicts itself. It’s as if the idea for this movie began as one of the episodes of the upcoming Twilight Zone revival but Peele decided that he wanted to turn it into a feature length movie. Evidence of this can be found in the similarities it shares with the aforementioned After Hours and Mirror Image episode. There are enough differences that it is clearly not an adaptation of the episode, but I can see how it inspired this movie. Further evidence can be witnessed in that it’s produced, written, and directed by Peele. When a storyteller wears that many hats, there is little room for checks and balances. Us feels like a feature length horror movie that would’ve been better off as a half hour or hour long installment in an anthology series. Starting off moderately strong, then very strong in the second act, the third act feels like it was from another movie idea altogether and forced to fit into this one. Too many ideas. All good individually, but convolute the plot when mashed together. The plot is too complex. What Us tries to do is ultimately too vast for what this movie is capable of delivering to audiences. Without getting into spoilers, I’d like to visit why the plot doesn’t work as well as it demonstrably shows it had the potential to have worked. We are clearly explained a particular relationship as having a one-way transference; however, there is a plot twist that completely contradicts this relationship. A best practice of screenwriting is to not introduce significantly new material, in the third act, that directly affects the present plot, which was not foreshadowed or setup in the previous two acts; this movie introduces lots of new plot elements in the third act that further complicate versus tying up. For most of the movie, the plot lives in a believable reality, but then it takes a turn that takes it from something terrifyingly possible to nearly unbelievable. And the power of a movie such as this is that it feels possible within the world that’s created on screen. If the characters are making a statement, they run out of people to receive that statement through the course of events. Perhaps if there was a greater supernatural element in the screenplay that it would have worked much better, because the supernatural could have explained how and why much better than the science-fiction approach. What is lacking here is a singular vision. Now that I have gotten all the things that I didn’t care for out of the way, I want to finish this article with what works brilliantly! The performances are outstanding, the score is excellent, and even the cinematography is noteworthy. Of all the stellar performances, Lupita’s is the one that stood out to me the most. As an Oscar winner, I expect her to deliver an impeccable performance, and she does precisely that! I felt what she was feeling, I empathized with her greatly, and she held my attention for the duration of the movie. I’m careful not to project an Oscar nom out of this because I thought Toni Collette’s performance in Hereditary was Oscar and Golden Globe worthy, and we all know what happened with that. Love this score! The classic orchestral approach fit this movie exceptionally well. The score worked so well that it almost felt like a character in and of itself. A well-composed score should be a diegetic extension of the story, the emotional beats, and action; and this one is all those things! Cinematography should never be overlooked as greatly contributing to how a story is being told. It is the element that places us in objective or subjective points of view or prompts us to interpret a scene in a particular way. There are some beautiful shots in this movie that are framed with precision. All throughout the movie, the cinematography plays a strong role in crafting the full experience of Us. Regardless if you like or love this movie, you are definitely in for a fun time! Perhaps I have issues with the writing and directing (two important elements in the crafting of a movie) but I still enjoyed myself and am confident that you will too. I don’t think it will become a classic in the way that Get Out will be one day, but it’s one to watch anyhow. Lots of great concepts here, but Peele doesn’t strongly deliver any one of them. You can join Ryan at the cinema most weeks at Studio Movie Grill Tampa.